Chase Ink Business Preferred Card Reviews - Good Business Credit Card? Chase’s new Ink Business Preferred credit card offers a terrific points bonus for new cardmembers, but its fees and rates may make you look for a different business credit card. 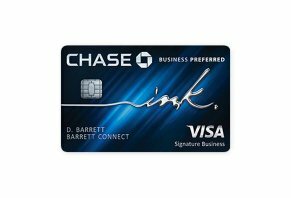 The Chase Ink Business Preferred Card is a new credit card from Chase designed for business owners. The card provides sizeable points bonuses for early spending and business purchases. The Ink Business Preferred is one of two Chase business credit cards – the other is the Ink Cash card. The big difference between these cards is the rewards you get, and we’ll break down those rewards, as well as the card’s rates and fees, in the next few minutes we have together. Also, to give you a better sense of how people like this card, we’ll include some expert opinions, too. We’ll finish up with some general thoughts about the Chase Ink Business Preferred Card and how it compares to competing business cards. One of the things you’ll discover is that, while business credit cards aren’t as numerous as consumer credit cards, there are still dozens of options from which you can choose. Finding the right card is a matter of understanding what you want out of it; yes, it’s that simple. Business cards typically offer you cash back or points that can go toward certain travel rewards programs. In terms of value, travel cards tend to offer you more – 12,000 points with American Express’ Starwood Preferred Guest Card could get you one night in a $300 hotel, while 12,000 points with the Ink Cash card gets $120. If you would rather get some free travel out of a credit card, the Ink Business Preferred has some qualities you’ll love (more on that in a few seconds). However, if it’s cash you want, check out our review of the Ink Cash for Business card. Consider this card – and every credit card – a combination of short-term and long-term rewards and benefits. As you read over these various benefits, start to ask yourself whether or not the Ink Preferred is something you’ll actually enjoy and use. There’s no sense in signing up for a credit card if it’s not giving you rewards that you’ll use. You’ll get 80,000 Chase Ultimate Rewards points if you can spend $5,000 in the first three months. Those 80,000 “CUR” points can be used to buy flights or hotel nights through the Chase Ultimate Rewards portal, but you can also transfer the points 1-for-1 to a number of frequent flyer/hotel loyalty programs. Earning these points is pretty straightforward, but remember that the three-month clock starts ticking the day Chase approves you for the card, not the day you receive it in the mail. As for the Ultimate Rewards program, Chase automatically enrolls you so that transferring or using your points is just a matter of a few clicks. Another advantage of this card is that you get a 25% bonus when you book travel through the Ultimate Rewards portal. Chase quotes you a cash price for the booking, then calculates how many points it will cost you. So, a room that costs $250 should normally require 25,000 points, but with your 25% bonus, it will only cost you 20,000 points. Beware of hidden markups, though. We found through our research of three popular destinations that, while the CUR portal will cost you less points than booking with a hotel loyalty program, their cash prices tend to be higher than what you’d pay on Kayak.com. If you’re looking to use your CUR points for domestic flights, we recommend transferring them to Southwest’s Rapid Rewards program. As our review of the Southwest Rapid Rewards Premier credit card shows, 80,000 points can get you at least four round-trip flights. While the short-term rewards with this card are pretty strong, you need to weigh the long-term rewards to make sure this card will be worth it a few years down the road. There’s no sense in paying the card’s annual fee if it’s not going to be useful. Like all travel rewards cards, the Chase Ink Business Preferred card gives you bonuses every time you use your card to make a purchase. You’ll get 3 points for every dollar you spend in the following categories: shipping; advertising purchases made with social media sites and search engines; travel; internet, cable, and phone services. There’s a catch to this, though. Chase’s consumer cardholders get their points at the end of the month, but business cardholders get their points on their cardmember anniversary. This only applies to accrued points and not your 80K bonus points – those show up 8-12 weeks after hitting the spending threshold. As long as your account is open and in good standing, you won’t lose your points. The second main long-term benefit of the Ink Preferred card is its suite of travel and purchase protection plans. Keep in mind, though, that these plans are available, in one way or another, to all Chase cardholders and not just Ink Preferred customers. When you use your card to buy travel or pay for expenses due to trip delays, Chase will reimburse you for the troubles. In the case of trip cancellation or interruption, you could be eligible for up to $5,000 per trip if your travel was non-refundable and you incurred expenses related to your travels (tours, cab fares, etc.). If your trip is delayed more than 12 hours, Chase may reimburse you for any lodging and other expenses you rack up because of the delay. The cap on the reimbursement is $500. In both of these situations, there are rules and details restricting payouts. These details can be read in the benefits guide you’re sent when you receive the card. The cardholder, his/her spouse, children, children’s spouses, other relatives and employees traveling with the cardholder are covered. If a trip is canceled because of sickness, you have to have a doctor’s note saying traveling is medically inadvisable. This is a pretty standard suite of shopping benefits and, like the travel protections we listed above, come with their own series of limits and exceptions. Purchase protection, for example, is good on items that are stolen or damaged within 120 days of purchase. You’ll have to provide proof of the damage or the theft, and Chase is required to give you a decision on the claim within 15 days of them receiving the requested proof. Items that aren’t covered include, but aren’t limited to, animals, living plants, antiques, collectible items, computer software, items lost via mail carriers, medical equipment, and jewelry in your baggage that you didn’t carry by hand. By comparison, the Capital One Spark Cash card has a single APR of 17.49% and an annual fee of $59 that’s waived the first year. Because this is a new card, there aren’t that many cardholder reviews of the Ink Business Preferred. However, there are plenty of expert reviews on the card. These reviews can help you get an overall view of the Ink’s strong and weak points. We agree with what other credit card experts have said: The Ink Business Preferred is one of the top business credit cards on the market. The most frequent praise of this card was its rewards points – no other consumer credit cards from Chase offer that many points. Certain Hilton and Marriott cards offer more bonus points, but our research indicates that Chase Ultimate Rewards points are far more valuable. So, know that you’re getting a great introductory bonus with this card – arguably the best in the industry. Criticism of this card centers on its APR and annual fee, both of which are warranted. The Ink Business Preferred’s $95 annual fee is considerably higher than the Spark Cash. Both the Ink Cash and the American Express SimplyCash Plus don’t have an annual fee. Also, the Ink Preferred’s low-end APR of 16.49% is nearly 3% higher than the Ink Cash’s 13.74% but a full percent lower than the Spark’s flat APR of 17.49%. The American Express SimplyCash Plus has a low APR of 12.74%. As you can see, the Ink Business Preferred’s interest rate is pretty high compared to the competition. However, this interest rate will only come into play if you don’t pay your balance off in full, every month. You also need to keep in mind that this card has a penalty APR, which means your interest rate could go up to 29.99% if you make one late payment. Worse yet, Chase says the APR could stay that high indefinitely. As business cards go, the Ink Business Preferred leads the industry in several areas both good and bad. You aren’t going to find a card that has such a valuable introductory bonus. Depending on your flight preferences, you could use your 80K points to book four round-trip flights with Southwest. Hotel-wise, these points are best used with the World of Hyatt program – Category 3 hotels, which include Hyatt Regency and Grand Hyatt, can be booked for 12,000 points a night. The downsides to this card are its high annual fee and APR. If you know you’re going to carry a balance on this card, you’re most likely going to pay hundreds of dollars more in interest than you would with the AmEx SimplyCash Plus or the Ink Cash. One business card we’ve yet to expand on is American Express’ business version of their Starwood Preferred Guest card. This card deserves to be in the conversation because, like the Ink Business Preferred, it’s a travel rewards card. The SPG card has a low-end APR of 15.74% and a $95 annual fee that’s waived the first year. The intro points bonus is lower – 35K – but SPG hotels have great redemption rates in relation to their level of luxury and style. Is the Chase Ink Business Preferred card right for you? Well, if you know you’re going to carry a balance on your card, it may be worth it to check out the AmEx SPG business card. The APR is lower and you still get a decent amount of rewards points. However, if you like Chase credit cards or you prefer to fly with United or Southwest, then the Ink Business Preferred’s bonus points can give you multiple free flights on those two airlines. If you want to learn more about credit card rewards programs and learn about the other credit cards we’ve reviewed, stop by our “Best Credit Cards of 2017” page. You’ll find in-depth reviews like the one you read here, as well as explanations of big-picture themes like understanding the fine print, how to build a solid financial plan and how to raise your credit scores. Write a Review for Chase Ink Business Preferred Card!